All of us will have experienced dry hands at some point in our lives, and although they may only seem like a minor problem, when your hands feel like sandpaper it can have an effect on your confidence. The state of our hands are one of the first things that people notice about us, as we use our hands to express ourselves, type, greet people and generally go about our daily tasks. It’s little wonder that it doesn’t take much for our hands to start looking a tad worse for wear, as they are constantly exposed to the elements, and frequent hand washing means that they can get dehydrated very quickly. The best way of ensuring that your hands are always in tip top condition is to make sure that you moisturise them frequently with a good hand cream. 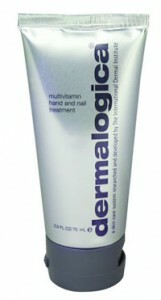 Dermalogica Multivitamin Hand & Nail Treatment is great for frequent use, and intensively moisturises without being overly greasy. In addition to making your fingers feel fantastic, the treatment also hydrates nails- so you never need to feel embarrassed when going in for that all important handshake again.